There are two things rescues are always short of: volunteers and money. Everyone associated with CPR is a volunteer giving what they can to make a difference in a pug’s life. Whether you donate time, money, dog food, or anything else it’s greatly appreciated and needed. Many people who cannot foster or live too far away, have asked us how they can help. Below is a list of items that are always in demand, in addition to the financial needs of our rescues. If you know you haven’t got the time for housebreaking, teething and the rest that goes with being a pet owner but you want to help, Virtual Fostering is another way to show your support and make a difference for one of our rescues. If you would like to make a donation to help one of our rescues specifically, just click the Paypal button below and name the lucky pug in the message area of the donation page. You can even send a donation with your credit card there. Your donations will go toward that pug’s medical care and food. The smallest donation makes a huge difference. We will be glad to send you updates about your virtual foster Pug. If you would like to make a donation with a credit card or through, just click the One-Time or Subscribe buttons to the right and you will be taken to the PayPal login page. 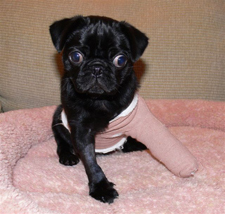 Your donation will go toward the pugs’ medical care and food. The smallest donation makes a huge difference. Thank you for your support. *Compassionate Pug Rescue is a tax exempt 501(c)3 non-profit organization. All donations made to Compassionate Pug Rescue are tax deductible as allowed by the Internal Revenue Service. Tax ID #65-1136714. When you buy through iGive CPR benefits! We would just like to remind you that when you shop with iGive and specify Compassionate Pug Rescue as your charity of choice, a portion of every purchase is donated to CPR. And best of all, iGive lets you shop from 700 different brand name stores. Shopping at iGive is a great way to help support the pugs of CPR while finding bargains in the coming year.